While the cat's away, the mouse will play. Or is it, while the girls are away, the CAT will play...? Carlin has been plotting his "Ten Movies in a Weekend" for a while and is super thrilled to put it into action while Annaliese and I are off visiting family. 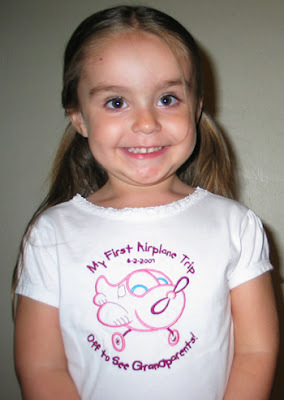 Just as Annaliese got a T-shirt to commemorate her first flight, I made this shirt for Carlin for the Film Festival he's hosting this weekend. For more details, visit his blog Nerd Lunch. 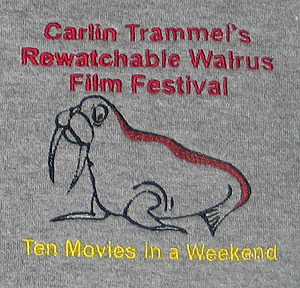 The walrus was a freebie from Ann the Gran, and the text "Carlin Trammel's Rewatchable Walrus Film Festival" was added with Embird Alphabet #2. One of the benefits of going home to visit this weekend is that I'll get to see my baby brother graduate from school (he's been attending UTI in Chicago). I didn't get to go to his high school graduation, so this will be a special treat. I made this gift card holder for him today. The in-hoop design was a freebie from Embroidery Garden, the cap/tassle came off of another freebie from Sew Forum, and the text was added with Embird Alphabet #33. I decided to try variegated thread for the satin stitch edge. It turned out pretty neat! 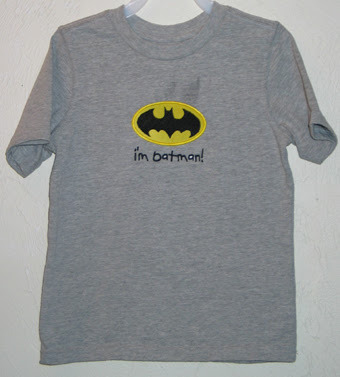 Jason and Anna, friends back home, asked me to make these t-shirts for their twin nephews' 4th birthday. 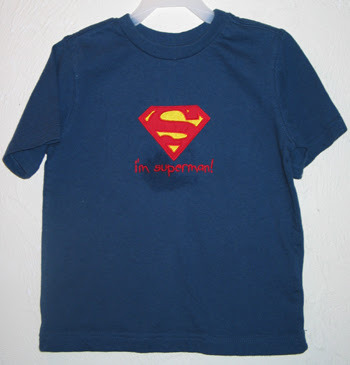 They each run around pretending to be their favorite superhero, so they should be excited to open the shirts! Even though I'm heading home this week, I'm going to be a couple hours too late to personally deliver them to Jason and Anna before they leave for the party. So I rushed to get them in the mail today. Hence the pictures show where I've spritzed them with water to remove my marking lines and stabilizer. I'd love to see pictures of the boys in their shirts after Saturday's party!! 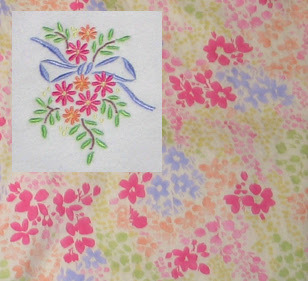 The applique designs came from my mother-in-law, the text was added with Embird Alphabet #18. 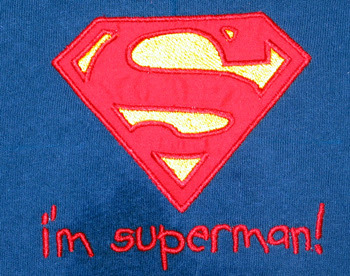 The design came from Embroidery Library, and the text was added with Embird Alphabet #18. 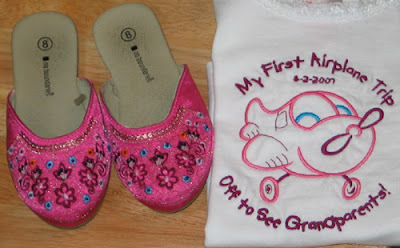 I chose the colors to match Annaliese's pink shoes, which Grandmama mailed to her a couple months ago. Thanks to all the advice I've gotten, these slip-on shoes will be perfect for going through airport security. 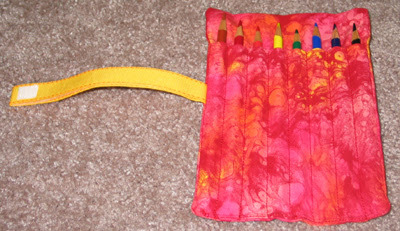 Today I made this pencil roll for Annaliese to hold her colored pencils. It works just like the crayon one, but different dimensions. 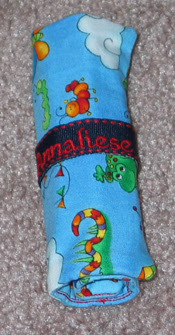 Last week I made this crayon roll for Annaliese. It was great at church on Sunday -- usually her crayons are in a plastic bag which is loud. 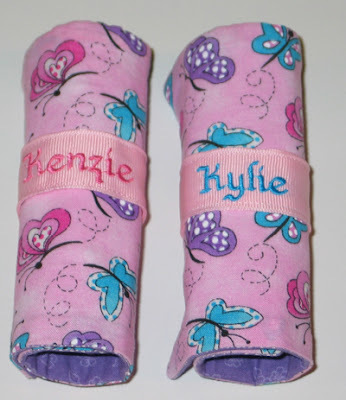 This is quiet and keeps them from rolling around on the pew or floor! 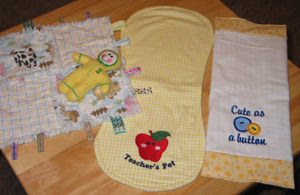 Yesterday the Mosiers came over -- while the girls played in Annaliese's room, the mommies played with fabric and designs! Kristen brought a pillow from baby Hudson's room so we could match colors (brown, turquoise, olive green, and natural). 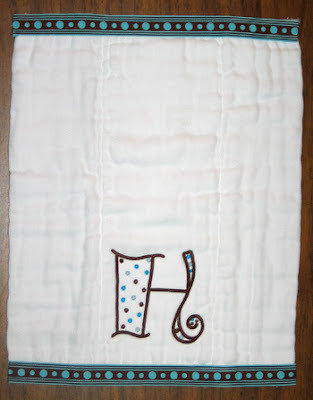 We picked this ribbon and design (a freebie from Sew Forum) and stitched it out on a cloth diaper from Stitched and Stamped. 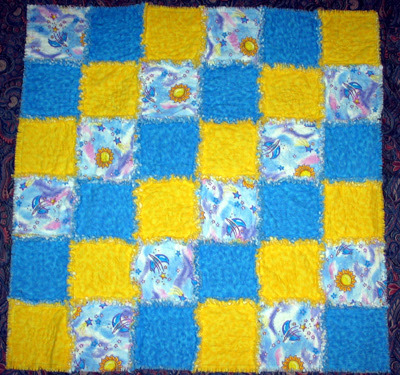 I decided to post this final product now since Kristen has already seen it in person, but the rest of her baby gift will debut at her shower in a couple weeks. 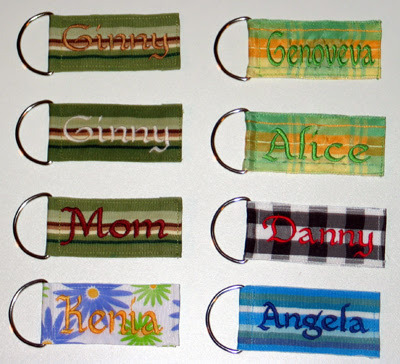 After seeing my embroidered pacifier clip at Rachel's shower, Ginny asked me to make some embroidered key chains for herself and her future tenants. The beautiful thing is that she had a sample for me to follow, bought all the ribbon and D-rings, and came over to pick out matching threads. 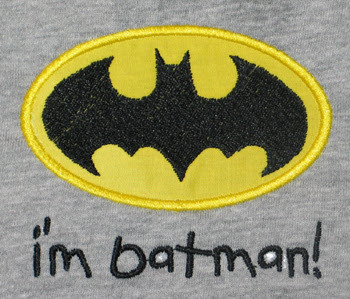 They were fun to do and in the process I learned new things about my machine and embroidery software. I used Embird Alphabet #33 for all of these, making the names fit into a 1"x3" rectangle. Last Saturday I picked up this denim tote bag on clearance ($1.97!!) at Jo-Anns. 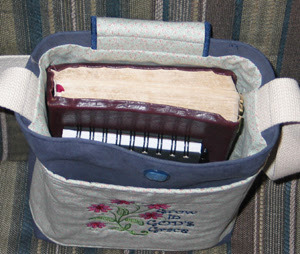 I knew right away what I wanted to use it for -- a bag for Annaliese to tote her books to and from the library. 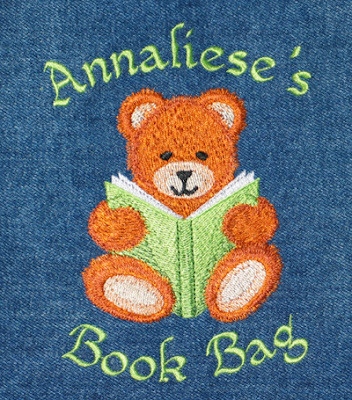 Embroidery Library has this cute bear design that I have admired for a long time. I was able to "purchase" it this weekend for free due to a sale and a prize gift certificate. 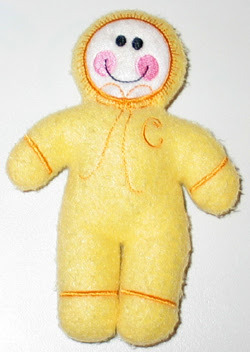 The text was added using Embird Alphabet #33. 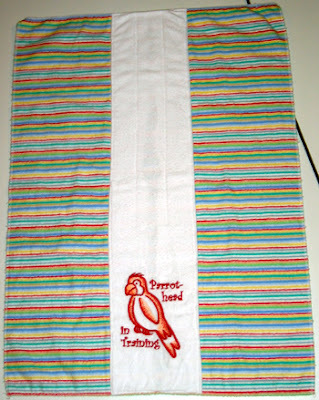 The design has a very high stitch count, so it took at least 1.5 hours to stitch out. Thankfully my thread color choice and placement on the bag turned out well! 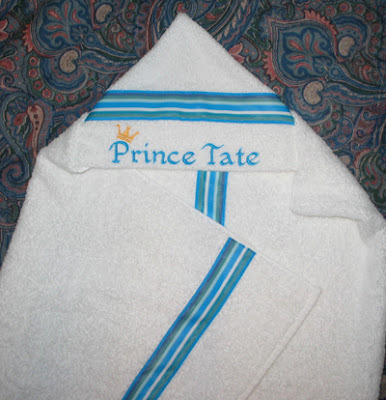 I received an order for these toddler towels. 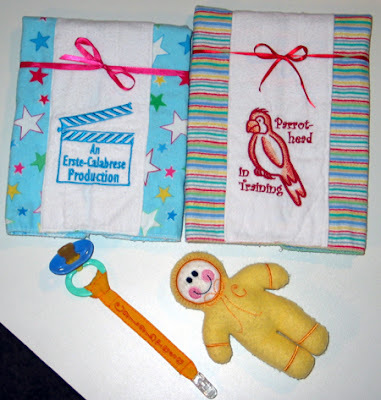 They will be given at a baby shower to a mom expecting boy/girl twins! I did the lettering with Embird Alphabets #17 and #33. 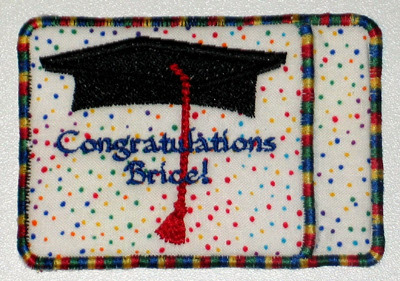 The crowns were lifted from designs from Embroidery Library. 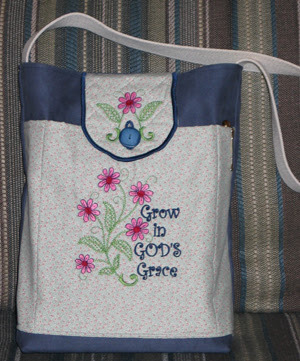 I worked on this tote bag off and on last week, completing it Saturday. The pattern for comes from A Time to Stitch. The instructions were very clear and the final product has a very polished look. 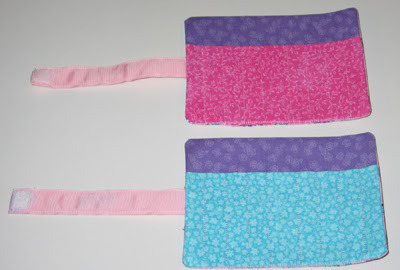 Two burp cloths -- I made these out of flannel. 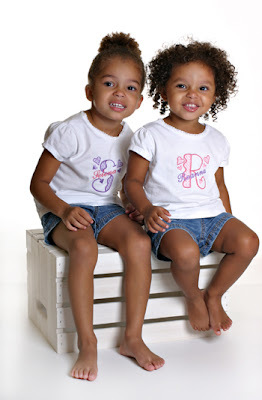 They turned out cute, but it's a lot of work... 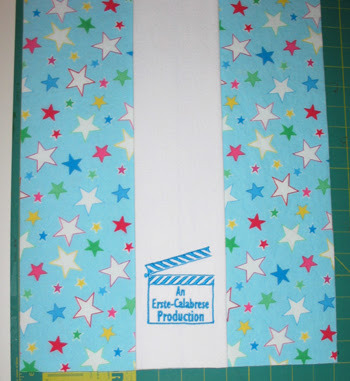 I got the clapboard from here and the text was inspired by a onesie I saw on Sew Forum. 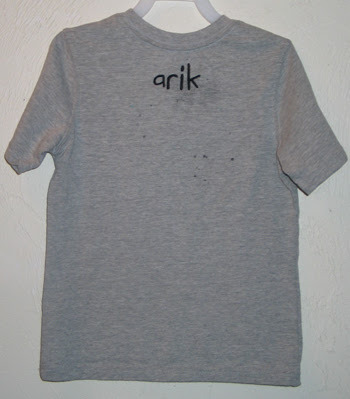 These shirts are for the Byrds! 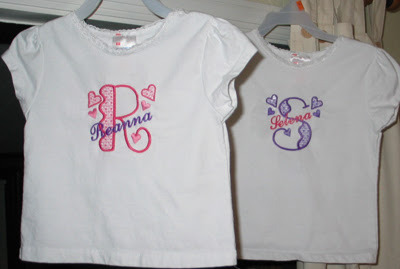 I got a surprise email from Terri saying they were going to be in town for the weekend, so I quickly made these matching t-shirts for her girls. 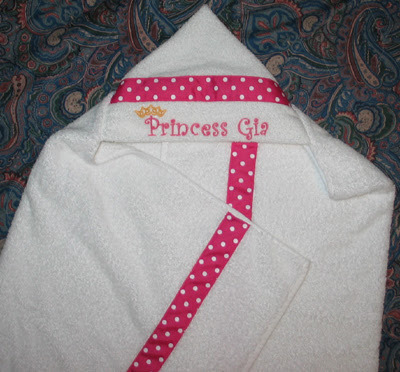 The monograms are from Five Star Anita's Lacy Girl Font, and the names came from Embroidery Name Library. Saturday's projects not only included the top for myself, but stuff for little boys. 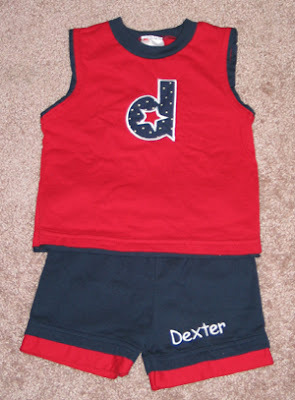 First up was Dexter's first birthday gift. I did a little outfit for him that matches Gideon's. 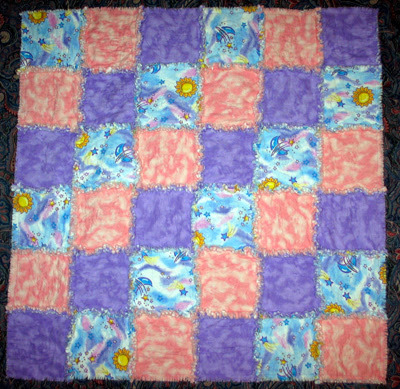 The "d" design was a freebie on Sew Forum. 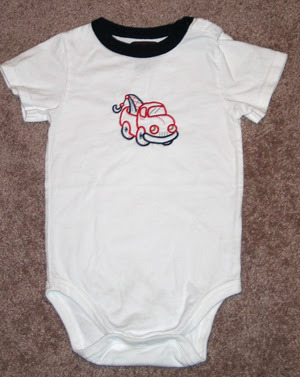 Next I did two coordinating onesies for Valerie's twin nephews. 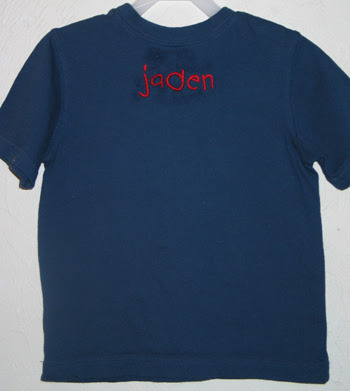 Her sister picked the designs (from Embroidery Library) and requested red and navy. I think they turned out cute! 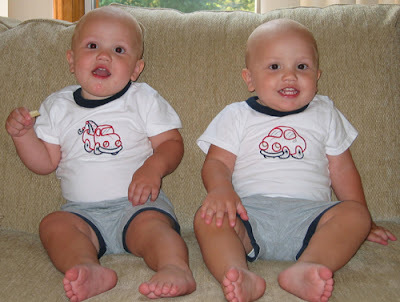 And here are Peyton and Connor in their shirts -- aren't they cuties?!? I finally did something for myself! 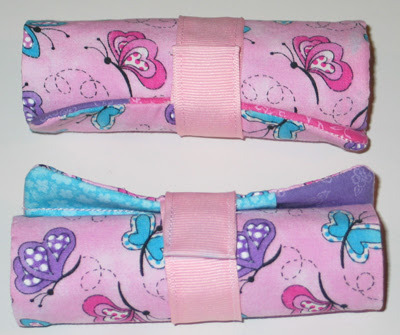 Included were two different styles of burp cloths. One, "Teacher's Pet" was posted previously. 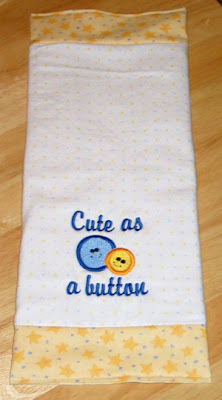 I made the "Cute as a Button" out of three layers of flannel with fabric added to the ends/back. The design came from Charming Station. 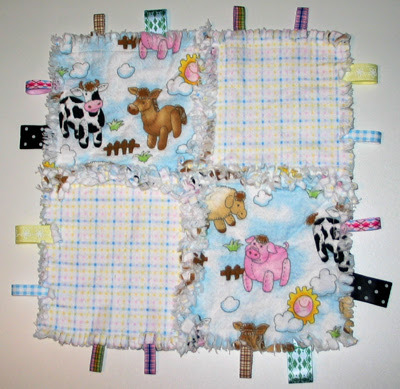 Next was a rag style flannel blankie with loops of ribbon -- a great sensory item. 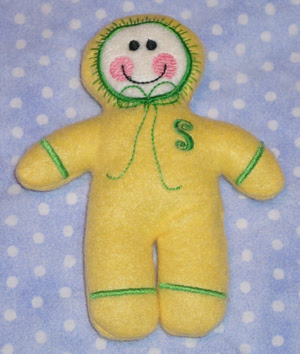 I also made a Snow Baby (design from The Embroidery Garden), adding the "S" to personalize it. 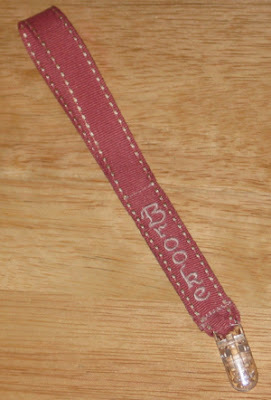 Finally I did a pacifier clip, personalizing the ribbon with their last name. 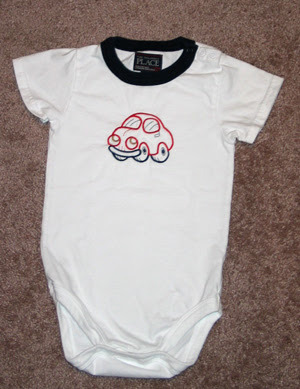 Once the darling baby is born and named, Rachel will get a few more personalized items!